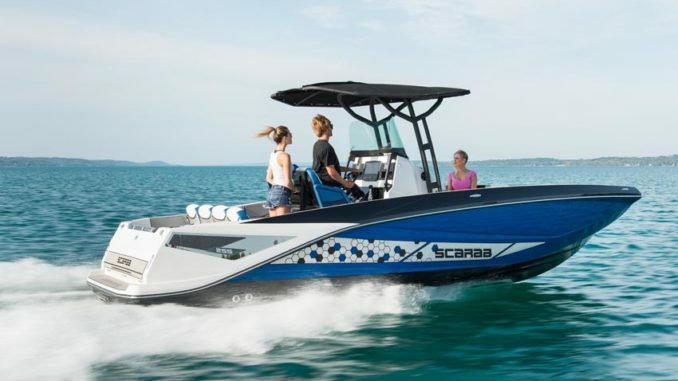 If you still think that the jet boat is only a beach toy to do pirouettes with and tow a tub, the Scarab 255 Open will surprise you. 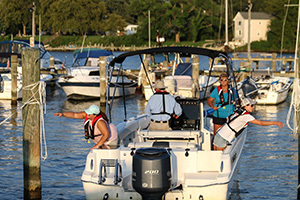 Breaking the codes of this type of boat, it offers a much larger program. Until now, the jet boat had the image of a sports boat designed to have fun near the coast, but with a limited program. 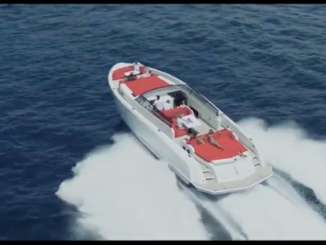 Since Scarab has refocused on jet propulsion, the brand continues to evolve the concept by offering family boats, more luxurious and now really more versatile with this model. The look is modern and sporty, especially in “ID” version but it keeps a certain elegance. As an Open version of the “classic” 255 which it borrows the hull from, this model offers a completely different layout. As the name suggests, it is an open boat, organized around a big central console but we still have enough room to circulate in the boat. The front section has a friendly space with U-shaped chests that you can place cushions on and a central table. The whole can even be turned into a very good sized solarium. A complementary seat is also integrated on the front of the console, just above a small storage box. In addition, the entire front of the console opens to give access to a large storage area. There is enough space for the equipment or even to accommodate a w.c. The rear also offers good modularity since the engine compartment receives a solarium with a removable backrest to add a seat. This boat doesn’t really have a transom, but a large board that you can unfold entirely to form a beautiful swim platform, ideal for swimming, fishing or water sports. On the side, the high freeboard edge (31’’) provides a good level of security and handrails placed everywhere can be easily held. 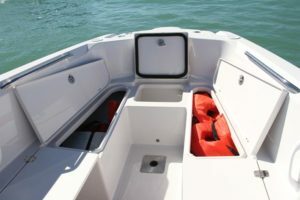 In the center of the boat, the console is quite large and almost “fishing” type with a beautiful dashboard at the top and, on both sides, a storage space and a place to slide a smartphone, is rather smart. Lower down, there are cup holders and the throttle is easily accessible. Everything is effectively protected by a nice windshield. The only regret is that there is no closed glove box. 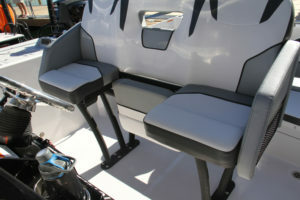 The pilot bench has three parts with folding seats for better versatility and also a good lateral support to take “G” turns. If the driving position remains excellent, we regret the lack of a cushion for the knees, very useful in bad weather. 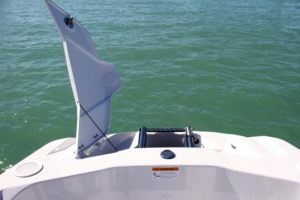 A good option that you can afford is the beautiful T-Top that brings shade and adds a little style to a boat. To propel this jet boat, there are two Rotax engines of 150 hp. Developed by BRP, these engines are known for their dynamism and in the Scarab, they do not disappoint. The first good surprise is the sound level, which is very contained and makes the cruise pleasant. The other good surprise comes obviously by pushing the throttle. Very reactive, the boat planes in less than 3 seconds and reaches up to 25 mph in just 7 seconds. Do not be surprised when you see the tachometer needle spinning. The Rotax need turns to express themselves and to get the maximum speed. You have to climb up to 8000 rpm. From there, as soon as we pass over 5000 rpm, the boat is really « full of life » with a cruising speed of around 32 mph and a maximum speed above 54 mph. It’s pretty good for this kind of boat. Moreover, unlike the older generation of jet boats, the Scarab’s hull is very efficient and safe. Stable and balanced, it also keeps the direction perfectly (it was the default of most of the jet boats) and the boat is even comfortable in choppy conditions. Same behavior in curve where the boat does not slip but offers a grip worthy of a fishing boat. 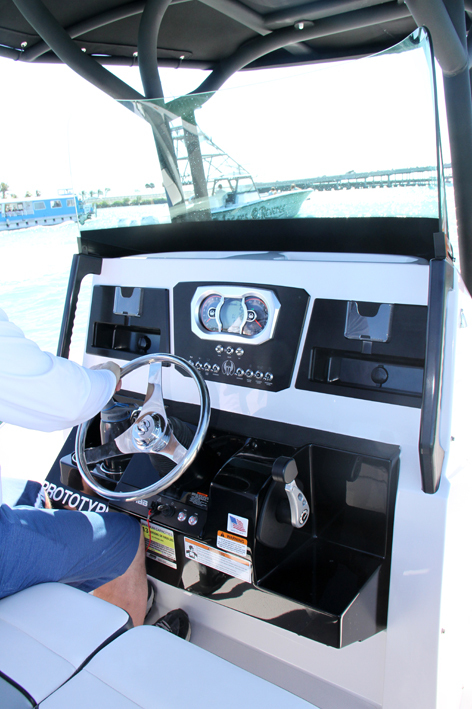 Well protected by its high bow and its deep cockpit, the Scarab allows for some offshore fishing trips. 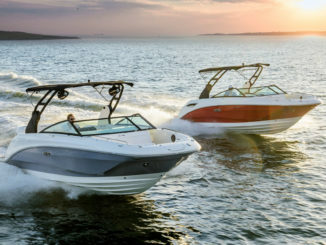 Regarding the equipment, the 255 Open is not miserly since it proposes a cooler, two USB ports, a stereo system, navigation lights and the front swim ladder. 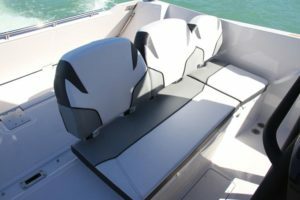 The boat is also offered in two versions”G” and « ID,” with better equipment and more options you have the freedom to customize your boat. 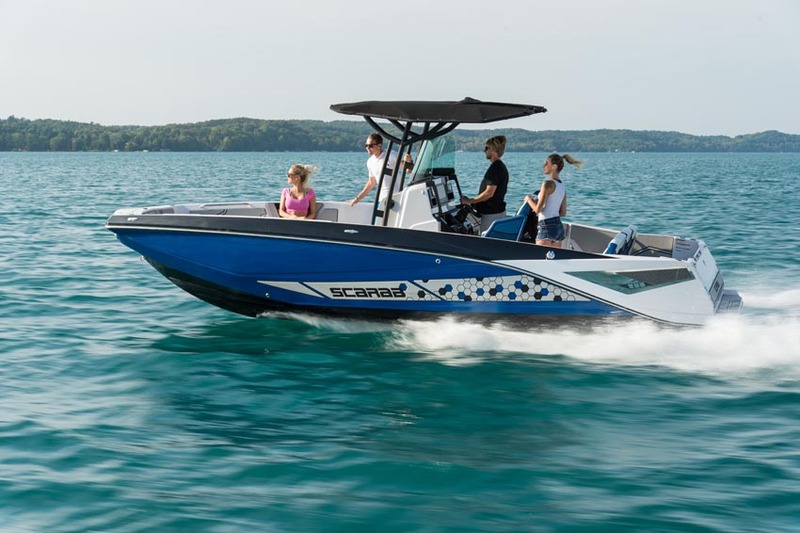 With the 255 Open, Scarab opens a new way in the world of the jet boat. Fun to drive, efficient, good on the sea and able to venture in shallow waters, it offers excellent versatility and it is very well made.